Cleaning Pergo flooring is like cleaning any other laminate flooring because they are made in a similar and basic way. So Pergo Laminate floors can be cleaned as described in prior articles written on daily or routine cleaning of laminate floors. However, with that stated, Pergo does have made recommendations for cleaning their laminate flooring. We do not agree with them but they recommend the following which came directly from their website on care and repair. Near the end of this article we have placed the link to their website outlining their recommended cleaning procedures. It is unclear or stated on Pergo’s website if these cleaning procedures are strictly for a residential home or also for commercial buildings such as retail. As stated by Pergo (See Below), they advise to never use a floor finish on their Pergo Laminate floor. Regarding commercial buildings, we can attest through experience and personal expertise that any laminate floor will not perform well including prematurely wearing out the laminate flooring without the use of a protective floor coating like a water based floor finish. So based on this experience and Pergo’s statement, Commercial buildings should consider the use of another type of flooring if using a floor finish would void Pergo’s warranty. NOTE: The following information came from Pergo’s Website. See the link below for additional information on Pergo Laminate Floors. 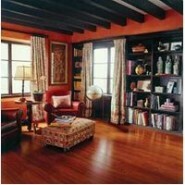 Pergo floors, like other fine furnishings in your home, require proper care to keep them looking their best. When you follow our easy cleaning and maintenance instructions, you’ll find taking care of your Pergo floor a snap! The surface layer of Pergo flooring is hard and compact, so dirt and dust do not adhere to it easily. The following simple steps are usually all it takes to keep your floor clean. For general cleaning, use a dust mop, vacuum with the hard-floor attachment of your vacuum cleaner or wipe occasionally with a damp cotton or cloth mop. For heavier cleaning, use Pergo Floor Cleaner or a mixture of household vinegar and water (1-cup vinegar to 1-gallon warm water) or household ammonia and water (1/2 cup ammonia to 1-gallon warm water). If an accident occurs and a stain remains, you can remove the worst stains with acetone or denatured alcohol on a soft cloth without bleaching or damaging the floor. In a pinch, nail polish remover containing acetone is a handy substitute. Do not use soap or detergent-based cleaners, wax-based products or any type of polish on Pergo floors, as they leave a dull, filmy residue. There is never a need to wax or refinish your Pergo floor. While Pergo is remarkably durable, there is of course no such thing as an indestructible flooring material. There are a few simple protective measures that are important to keep your floor looking new. To protect your Pergo floor from surface scratches, place walk-off area rugs or mats inside any exterior doorway to collect small bits of gravel they may track in on shoes. Use felt floor protectors (available at Pergo retailers) on the legs of chairs, sofas, TV stands, tables and other easily movable furniture. Replace plastic casters on chairs with rubber wheels and lift rather than slide heavy objects across the floor. Minor damage to a Pergo plank or tile can be easily repaired with Pergo Finishing Putty. If the damaged area is larger than 1/4 of an inch, a Pergo retailer can recommend a professional to replace an entire plank or tile. For chocolate, grease, juice, cordials and wine – use lukewarm water and a non-abrasive cleaner (such as, ammonia and water) or Pergo Floor Cleaner. For tar, markers, crayon, lipstick, oil, shoe polish, ink, nail polish and cigarette burns – use acetone/nail polish remover or denatured alcohol. Note: Do not use acetone on Pergo wall base or quarter round. For candle wax and chewing gum – let harden and scrape carefully with a blunt plastic scraper. It is a best practice to consult and refer to Pergo’s Laminate flooring manufacturer’s warranty for cleaning procedures and recommendations. It is always recommended to check with the manufacturer of the laminate floor before any maintenance is performed.